This weekend for the Amateurgolf.com Wine County Amateur I decided to use some of the Titleist balls given to me at the Crump Cup at Pine Valley. For two years now I’ve been exclusively a Taylor Made man, clubs and balls, but this weekend I thought I’d go back to a Titleist ball to see if I could notice a difference. I must start of by saying that I’ve had the best back to back years ever in my amateur career with back to back Northern California Player of The Yr honors playing just Taylor Made. I am extremely grateful to both companies for allowing me to use their high end equipment and balls. So back to this weekend, I’d have to say that I believe I hit the Titleist ball a little further both off the driver and irons, although I think they both roll equally as well on the putting green. I like the feel of the Titleist ball off my clubs a little better than the Taylor Made ball, but if I was paid $250,000 a year to play either ball I’d be biased towards the paying ball manufacturer. I’m not being paid, and at the risk of NOT getting anymore balls from Taylor Made I will say that I believe these are the best two balls in the game. It’s hard to argue with results as my 5 shot victory in the Am golf Wine Country Amateur shows that Titleist makes a winning ball. However I will say that the Taylor ball is equally impressive, but for me I feel like the Titleist ball cuts thru the wind slightly better than the Taylor ball. WHAT DO YOU THINK…….??? I especially enjoyed the competition with Eric Grimberg who plays for Saint Marys College. Eric is a well mannered player with a lot of talent. Eric didn’t finish his round out like he wanted to, but he was a fine gentleman and I enjoyed watching his talent in action. What I love about this game of golf is you never know how things are going to turn out until you finish the last hole. I’ve blown 4 shot leads in the past, and I’ve come from behind to win in grand fashion. It’s all about staying in the moment and NOT letting your emotions take control of the speed in which your decisions and pace of swing will go to in pressure situations. As an example today on the 17th tee I had a four shot lead going to a par three playing downwind to 198 yards. The pin was back left, so I aimed my six iron shot to the right middle of the green and hit a good shot 35 feet below the hole. Eric then took dead aim and flew his shot to the back tier where the pin was for a make able birdie chance. I lagged my birdie putt up the hill to about two feet from the hole for a comfortable par three (so I thought) Eric then drained his birdie putt leaving me to think about the 2 footer which I missed for several reasons. My mind was thinking that he just made a birdie and now I need to make this to keep a 3 shot lead going to the tough 18th hole…extra pressure and not in a zone I pulled my short putt and had to go to 18 two shots up where anything could happen. On 18 which is a 458 yard par 4 into a stiff breeze I was fired up to NOT make anymore mental errors and stay in the moment. After a great drive I rifled a 4 iron from 192 into a big breeze to 10 feet and drained the putt to close with an exclamation mark on the round and the tournament. Even the best players in the world need to stay in the moment and calm themselves when the pressure is the greatest. NOVATO, Calif. (January 30, 2011) — What looks, on the virtual scoreboard, like an easy five stroke victory in the Wine Country Cup for Randy Haag was anything but. 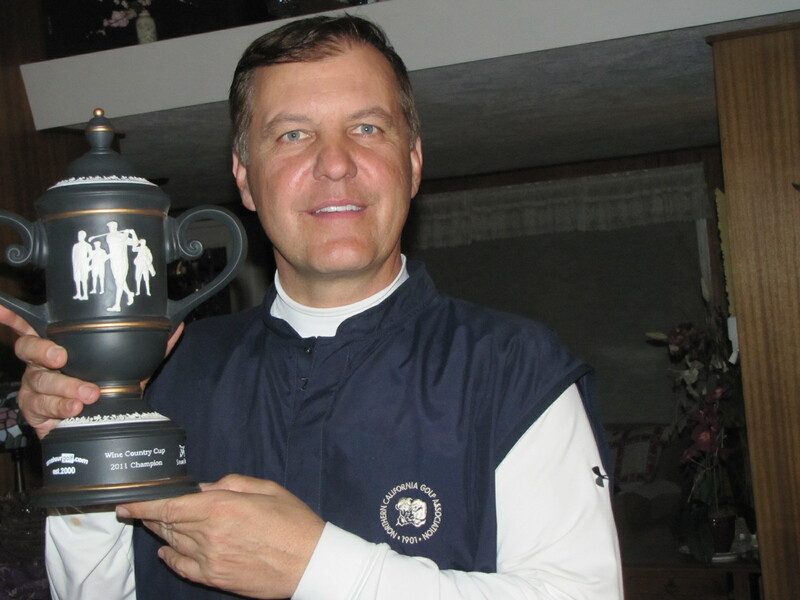 The all-time amateurgolf.com tournament wins leader and Player-of-the-Year in the amateurgolf.com Tournament Series (ever since we have kept points stats) usually dominates at StoneTree, and had already won this event four times. But doubts of pulling off a fifth victory crept in on Sunday afternoon when a game Eric Grimberg holed a birdie putt on the par 3 17th, while Haag missed a two foot come-backer for par. All of the sudden, a four stroke lead was down to two with a tough 18th hole left to play. Not only did he pull off the shot — which was into a two club wind — he made the 10 foot birdie putt and proved to himself, once again, that at age 52 he can still compete with players half his age. “That’s what these events are all about, the swings back in forth — pulling off shots when you need to,” said Haag. Not to take anything away from St. Mary’s Senior Grimberg, a 2009 Oregon transfer who grew up in Portland, but the tournament may not have been as close if Haag hadn’t three putted 5-times on Sunday. Grimberg, who started the day 2 strokes behind Haag at even par, turned that deficit into a one stroke lead after just two holes on Sunday by going birdie-birdie to Haag’s rough bogey-par start. After a three putt from close range on No. 1 spoiled the sweetness of a 300 yard drive down the middle, and a par on No. 2, Haag had not only lost the lead, he was in the unfamiliar position (at least for him) of having lost the tee as well. Grimberg placed a perfect long iron to the center of the green on the 192-yard 3rd hole, and Haag made a key decision to hunt down the elusive flag and the shot came off perfectly, leaving him a 3-footer which he holed for birdie. But two more three putts on the front nine were tough to stomach, especially after a John Daly-esque drive on the 9th over the hazard that left just 102 yards in for his second shot. A two stroke swing on the signature 15th hole when Grimberg suffered a double-bogey was really the turning point for Haag, who could have had a five shot lead on the 17th tee if not for recording his 5th three putt of the day at the par-5 16th, which he hit in two with a 5-iron. Playing well as of late, and working his way up the leaderboard into a tie for 2nd place, was Jerry Ledzinski of Carmel. Ledzinski tied Haag for low round of the day with a 1-over 73. At StoneTree, from the back tees after a rainy start, that’s solid golf.